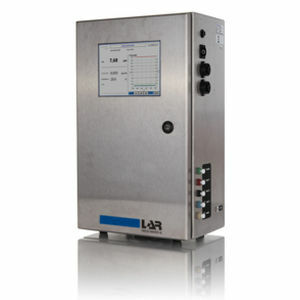 The TOC analyzer QuickTOC®trace from LAR Process Analysers is especially designed for the determination of lowest organic concentrations in ultrapure water. By means of UV oxidation and differential conductivity measurement, the TOC analyzer reliably determines organic loads in the range of 0.5 to 1000 ppb TOC and 0.055 to 2.0 μS/cm conductivity and is thus ideally suited for the TOC measurement of ultrapure water from the semiconductor industry, the photovoltaic industry and for the measurement of pharmaceutical water. The basic principle of operation is to measure the incoming conductivity of the sample (LF1), then oxidize the present organics in the sample with by UV radiation and finally to measure the outcoming conductivity (LF2). The resultant delta of the two conductivities represents the TOC concentration contained in the sample. The analyzer has a response time of less than 30 seconds and is characterized by a continuous measurement of every 2 seconds, enabling operators a fast measurement of TOC and the opportunity to control their processes. For ease of use, the QuickTOC®trace features an optionally measurement of up to 3 samples streams in one device and an integrated system suitability test (SST), which can be performed by the user at any time. Moreover, the long-lasting UV lamp and innovative process design results in low maintenance efforts and low operating costs.